Dr. Mahoney attended medical school at the University of Texas in Houston, Texas. He completed his residency at Columbia-Presbyterian Hospital in New York, New York. He is a third generation orthopedic Surgeon with more that 20 years of experience. He is an active member of the American Academy of Orthopedic Surgeons, Patrick Henry Medical Society and the American Board of Orthopedic Surgery. 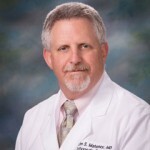 Dr. Mahoney volunteers at the local community theater and enjoys golf, fishing and gardening.